Spiky obsession: Eucomis vandermerwei is my favourite plant in the garden this week. Eucomis vandermerwei is my favourite plant in the garden this week. I always dread people buying me plants, what with having very specific taste, most of the common plants I want and little space, it doesn't lend itself to friends and family find things I needed. So it was an especially nice surprise when my parents dropped off this eucomis vandermerwei a few years back. 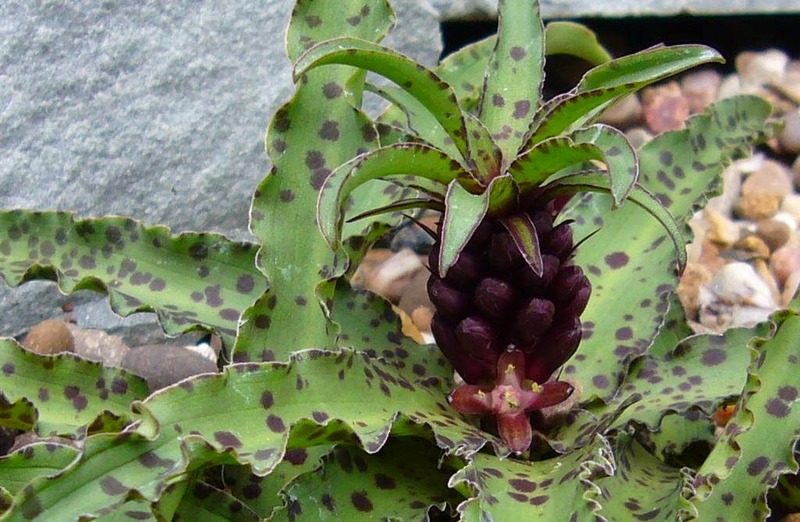 Most people seem to have at least one eucomis in their garden, as I did at the time. I had not heard of this one though, and in fact have yet to see it anywhere else. As you can see it is a lovely spotted form with very clear, defined purple spots on the leaves which tend to lie more prone to the ground. What makes this form different is the size, it is one of the smallest forms and grows to around 10cm tall. My whole clump, which contains 5 plants, is only 15cm across. It really doesn't show up in photos, and needs to be seen in person to see how perfect a dwarf form it is. It flowers in August for me, with the main plant flowering every year. 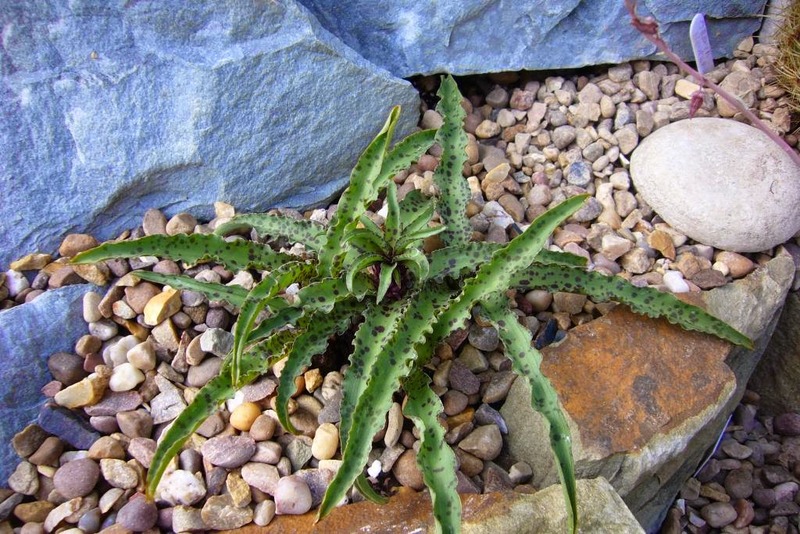 The offsets have yet to flower, but keeping it restricted in a pot may have slowed their growth. Being so small, you have to get pretty close to see the flowers properly. It will be interesting to see if it works in the rockery, or if it gets lost. 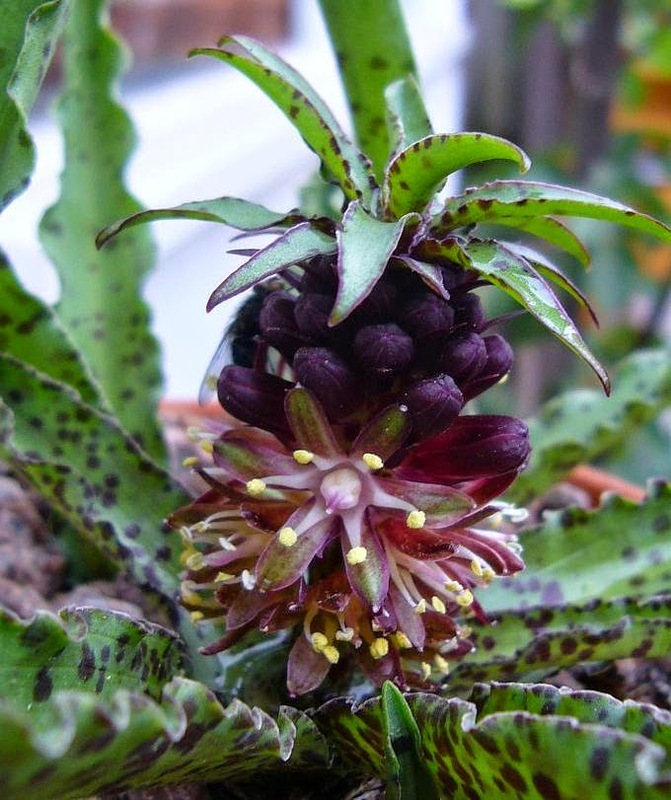 So there you have eucomis vandermerwei my favourite plant this week. Head over to Lorees blog Danger Garden to see other selections. E. bicolor and another one sparkling burgundy will probably be included in the garden at some point. That is an excellent little eucomis, how lucky you are (this time). I know. I found out later that they got it at one of the big flower shows at a rare plant stand. They have not bought me any plants since, a case of quitting while you're ahead I think. Wow, so unusual! Great foliage. The foliage is much more of a feature than the flowers. Definitely needs to be somewhere without anything else encroaching. Exquisite little gem! Mum & Dad picked a winner. Thank you. And they did. Thank Julian, I have never seen it for sale but it must be available somewhere. Fit perfectly with your type of succulent area as well, I'll let you know how it does this winter.